An actor famous for his role commanding a fictional starship will narrate NASA's real 'trek' to Mars in a new giant-screen film. Patrick Stewart, who as Jean-Luc Picard helmed the USS Enterprise on "Star Trek: The Next Generation," is lending his voice to "Journey to Space," a new large-format movie about the concepts, hardware and people carrying out the next generation missions to make humanity a spacefaring civilization. "Journey to Space," which will launch into select theaters in February, will take moviegoers on a behind-the-scenes tour of the international effort to send astronauts to Mars within the next two decades. The film, which is presented by the Boeing Company and Toyota, is being produced by K2 Communications and Giant Screen Films. "No longer science fiction, a human mission to Mars is in the planning stages, and major steps are being taken to make it a reality within a generation," Bob Kresser, chief executive officer of K2 Films, said. "Our goal in making this film was to tie together the actual hardware being built with the tremendous planning under way that will make the next steps in space exploration the most far-reaching in our history." As seen in its first trailer released last month, "Journey to Space" features scenes filmed at NASA facilities and by astronauts in space, as well as animation of NASA's next-generation Space Launch System heavy-lift rocket, Orion crew capsule, and "Olympus," a commercial concept for an inflatable transit habitat for long-duration missions. The one-minute preview also showed NASA astronauts training in an Orion mockup and working inside an immersive Mars rover simulator at the Johnson Space Center in Houston. In addition to looking forward, the documentary also looks back at the space shuttle program and the role it played in assembling the International Space Station. A third of the movie is devoted to how the shuttle helped us understand how to live and operate in space. Adding to the scenes filmed at the Johnson Space Center, the movie was also shot on location at NASA's Kennedy Space Center in Florida and at Bigelow Aerospace in Las Vegas where the Olympus module is being developed. The National Air and Space Museum in Washington, D.C. will host the world premiere in March. The film will screen in 2D and 3D in theaters across the country, including at the Kennedy Space Center in Florida, the U.S. Space and Rocket Center in Alabama and the Kansas Cosmosphere in Hutchinson beginning in February. In addition to the TV series, Stewart reprised his role as captain of the Enterprise in four "Star Trek" feature films. A Grammy Award winner and Tony, Emmy, and Golden Globe nominee, Stewart also portrayed Professor Charles Xavier in the "X-Men" film series. "Patrick's narration is the perfect icing on our space-story cake," Mark Krenzien, the director of "Journey to Space," said. "Everyone in the studio was beyond impressed by his enthusiasm for the project and his dedication to every nuance and detail." 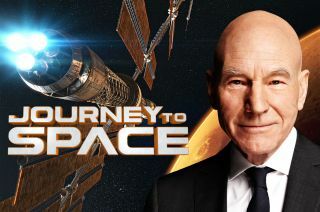 Click through to collectSPACE.com to watch the trailer for "Journey to Space."